Tea. It’s not just for drinking. Dip stark white lace into the hot brew and it takes on the shade of a lovely vintage ivory, explains Shirley Harper, 81, who keeps a trick or two up her perfectly tailored sleeve. Shirley muses about French Alencon lace like a poet immersed in verse. While the serial seamstress has tea-dyed many a piece of the delicate fabric, none were so steeped in love and sentiment as the trim stitched to one particular wedding gown. 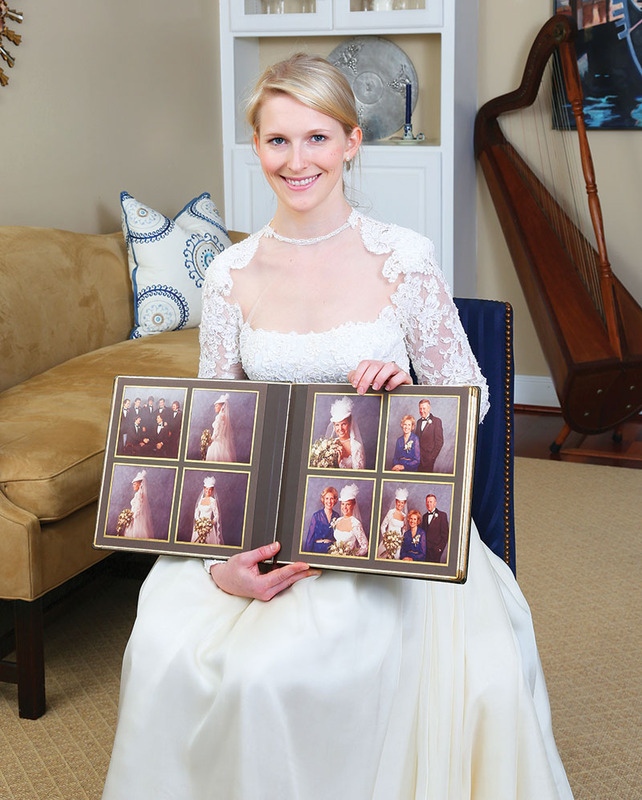 On a Hill Country bluff outside of Fredericksburg, the Sunday after Easter, beaming bride Erica Reed, 24, exchanged vows with St. John’s School sweetheart Benjamin Lee in the same classic wedding dress that her grandmother Shirley created for her own daughter, Mary Ann Reed, 37 years ago. Silk chiffon had replaced its original skirt of satin. Fresh tea-dyed lace blended with old, gently aged by time. “I know I’ll cry,” says Erica’s mother Mary Ann, blinking back tears. 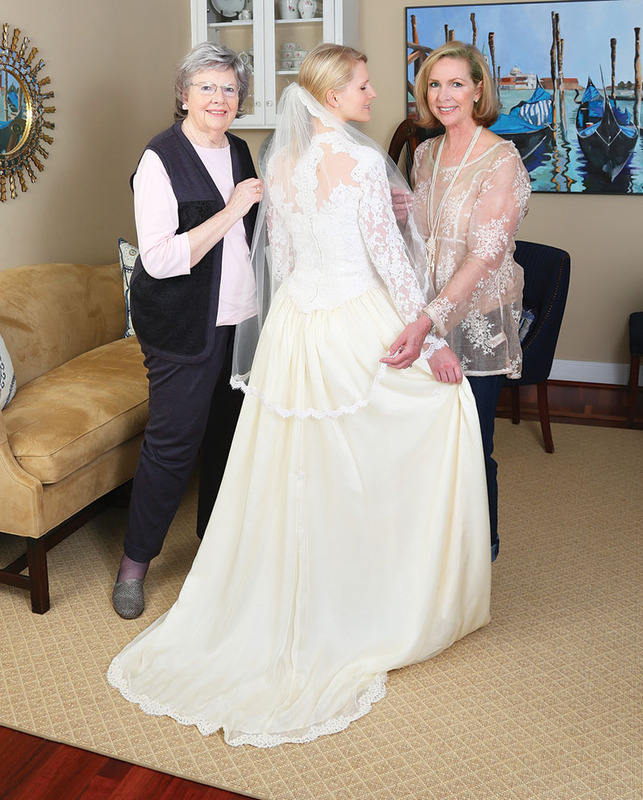 The three generations of women had gathered in Shirley’s small apartment at Brookdale West University senior living, weeks before final fitting. If not for a bit of luck and steely resilience, the evolving story of the dress could have ended mid-chapter. Two years ago on Mary Ann’s birthday, Shirley had a stroke, losing half of her vision in both eyes. “We didn’t even know if she’d be able to sew again,” says Mary Ann who, with husband Ted, settled her mom into Brookdale just three miles from their Bellaire home. She had been living alone in Peoria, Illinois, before. She can no longer drive. But by golly and a miracle, she can still sew. As if that curveball weren’t enough, Mother Nature lobbed one too. Hurricane Harvey flooded Mary Ann and Ted’s home last August. If not for neighbor Dana Corbett and her son Peter, the dress, stored in a cardboard box under the couple’s bed, could have been ruined altogether. They moved it to higher ground. Surely the bulls-eye was off the family’s back. “You would think,” Mary Ann says. Just weeks before the wedding, Shirley awoke to a left hand that wasn’t working. “It felt like a foreign object.” The stroke impaired mobility in her left hand and forearm. She was hospitalized for three days. Shirley can scarce remember pre-sewing days. Before long she was the family seamstress, adding to her own wardrobe and sewing shirts for her dad, a tall, strapping man and former basketball player for the Chicago Bruins. Cheerleader uniforms. Pom Pom girl outfits. She clothed entire cadres of girls at local Decatur schools. While other friends might see their prom dress on someone else, not Shirley’s daughters. Well, there was one year that Beth insisted on a store-bought gown. “It was cute. But when she saw two other dresses that were the same as hers she said never again,” the seamstress chuckles. Years came and went. Shirley kept sewing. Proms. Homecomings. Shirley made Beth’s wedding dress too. And the bridesmaid gowns for both daughters’ weddings. Then came a flurry of requests. Friends of her daughters. Their bridesmaids now getting married. Would she make their wedding dresses? Their bridesmaid dresses? “It snowballed,” says Shirley. 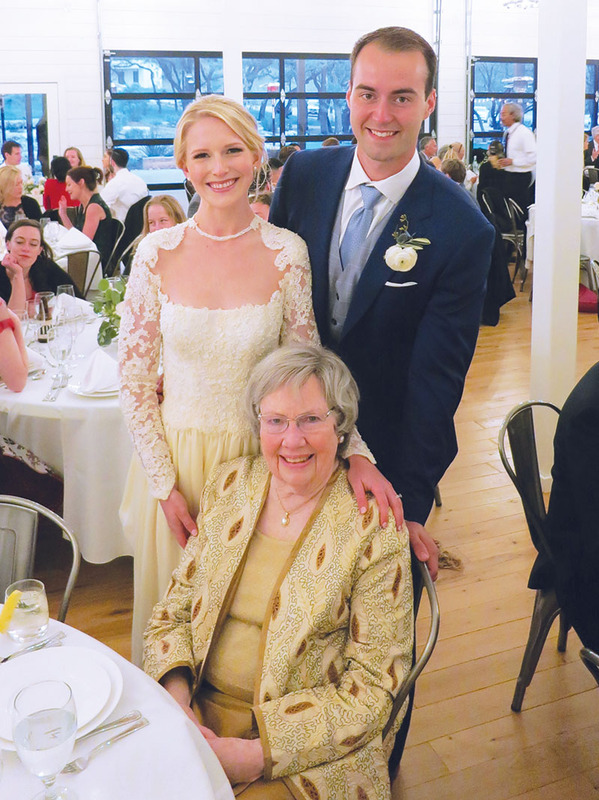 After divorcing, she moved from Decatur back to hometown Peoria and opened a bridal shop, Custom Wedding Gowns by Shirley. Business boomed. 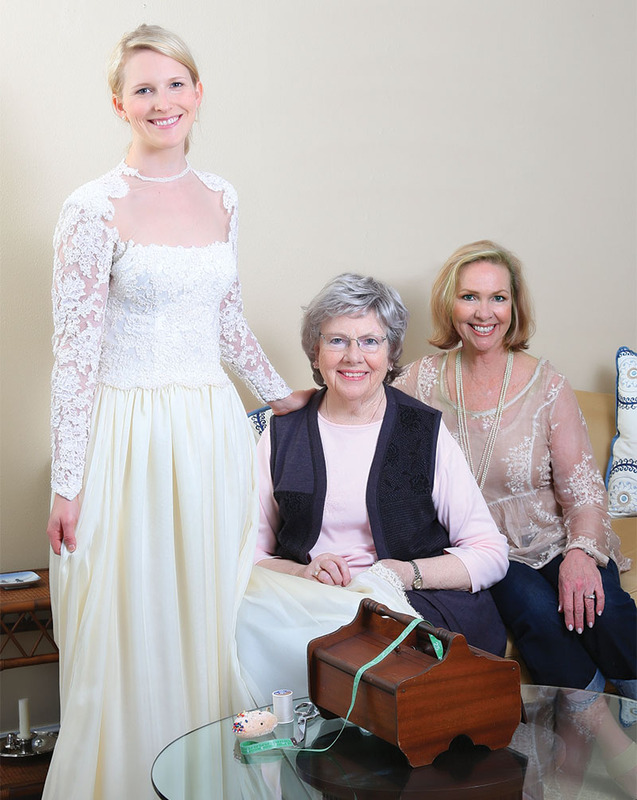 Central Illinois clamored for Shirley’s couture-quality wedding dresses. She goes to her closet, returning with an armful. A jacket in fine metallic brocade. A navy number in gold motif. A gold-tone dupioni silk skirt and matching jacket. “I love high quality fabric,” she says, revealing a stash in her cabinet, next to her sewing corner. 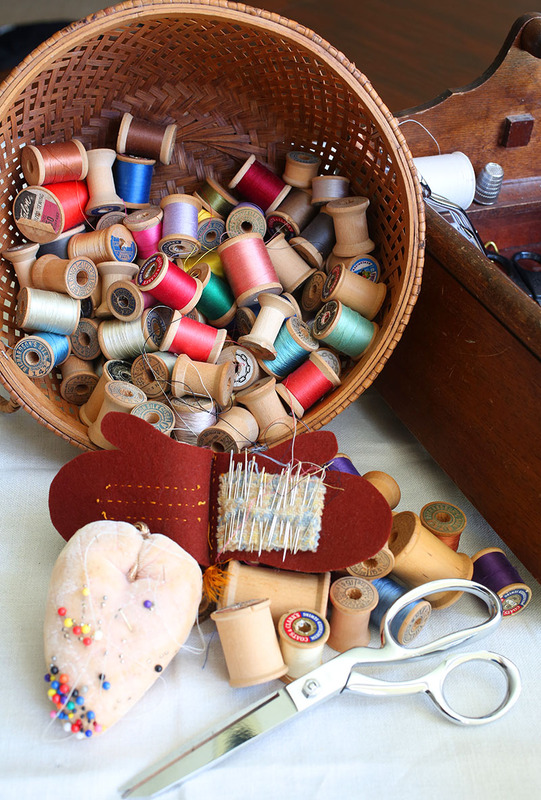 A sewing machine and racks of thread, every color, takes up residence next to her kitchen. She donated $2,000 of high quality fabric to the American Sewing Guild, of which she is a member, before downsizing to her apartment here. Erica and Benjamin, graduates of The University of Texas, are creative types themselves. Erica, an advertising major, studies art. A beautiful bird rendering she made for her grandmother sits front and center on Shirley’s wall. And her mechanical engineering husband Benjamin likes to dabble in all manner of artistic ventures. He made the leather belts for his groomsmen. Yep. There’s that. “So guess what they’re getting for a wedding gift from this one?” Mary Ann asks, putting the sideways glance to her mom.